Can you identify any of the Cubs in this photograph? A black and white large format negative of Marjorie Allan and three cubs examining two large white objects. Two tents can be seen in the background. The Camp is unidentified but it is possible that it is Camp Hood on the east side of Cochrane Street between Rossland Road and Taunton Road. 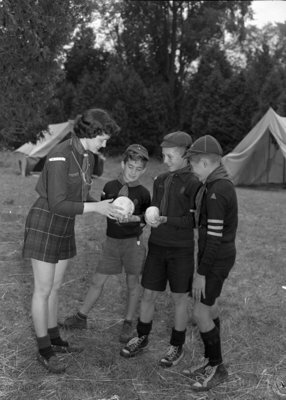 Whitby Cub Pack, August 9, 1950, Marjorie Ruddy. Whitby Archives A2013_040_243.